Paroxetine maleate is a selective serotonin reuptake inhibitor and an antidepressant. Duloxetine hydrochloride is a hydrochloride. It contains a duloxetine. DL-Dapoxteine HCl is a Selective serotonin reuptake inhibitor (SSRI). Vilazodone hydrochloride is a hydrochloride obtained by reaction of vilazodone with one equivalent of hydrochloric acid.Vilazodone Hydrochloride is a serotonin transporter (SER) inhibitor and 5-HT1A receptor partial agonist. Norfluoxetine is a metabolite of fluoxetine. Dapoxetine HCl is a short-acting novel selective serotonin reuptake inhibitor(SSRI). 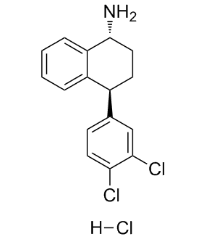 Dasotraline hydrochloride (SEP-225289 hydrochloride) is a triple reuptake inhibitor that blocks dopamine, norepinephrine, and serotonin transporters with IC50 values of 4, 6, and 11 nM, respectively. (1S-cis)-Milnacipran hydrochloride is a selective norepinephrine and serotonin reuptake inhibitor approved for the management of fibromyalgia. Milnacipran hydrochloride is a serotonin-norepinephrine reuptake inhibitor (SNRI) used in the clinical treatment of fibromyalgia. Levomilnacipran is the levo- enantiomer of milnacipran, and has similar effects and pharmacology, acting as a serotonin-norepinephrine reuptake inhibitor (SNRI).